A traditional German workpiece, the HÄNGEKRANZ, got a new name: FLYING WREATH! 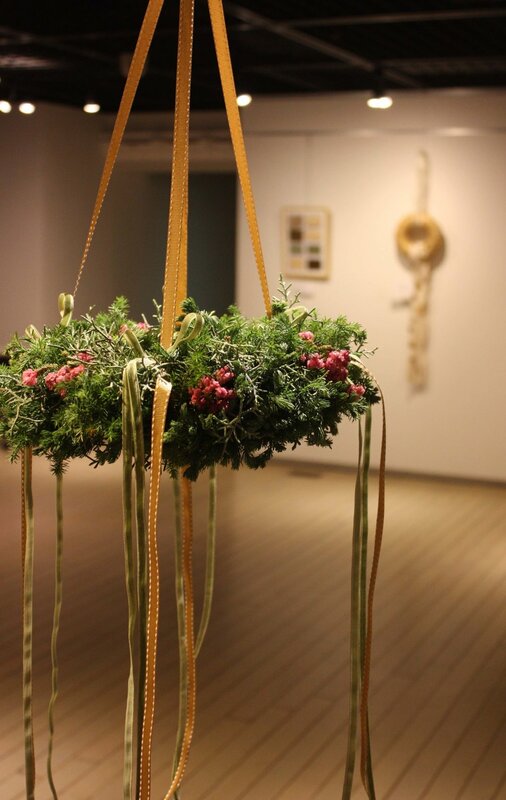 The important point of a flying wreath is not so much that it flies ( which it does not, it is hanging, don’t be afraid! ), the important part is, that it has 3 beautiful views: from above, from beyond, from the side. Let me show you how to do this! Let’s work together on my variation of a flying wreath, founded on the safe technique of tying natural materials similarly onto both sides of a wreath. Right now, I am planning on a dark green wreath with honey yellow candles! As a second theme, we will create a flat Christmas tree! A tree which you can lean against the wall or put on the wall, not that huge, just the right size , around 60 cm. We will work with natural twigs and dry materials to create a unique impression. Right now, I am imagining brown tones with creme and grey shades, and mushrooms, of course.